304HP 3.6L V6 Cylinder Engine - 6 cyl. With stunning looks, exciting performance, and smart technology, the Camaro is the complete package. 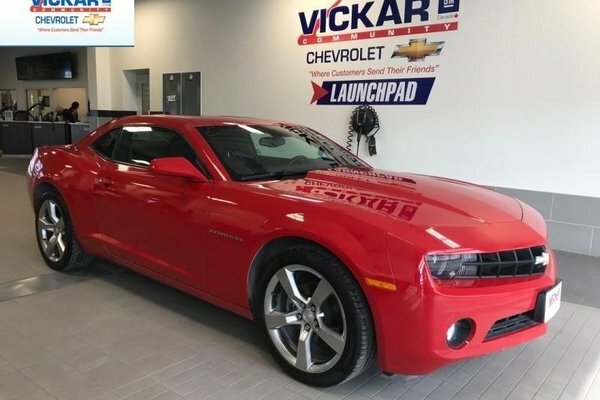 This 2010 Chevrolet Camaro is for sale today in Winnipeg. A muscle car icon has returned as the 2010 Chevrolet Camaro, a two-door sports coupe that brings 1960's style into the 21st century. The Camaro name returns after a six-year absence as an all-new sports car with styling inspired by the original Camaros, paired with thoroughly modern powertrains and some of the latest high-technology interior conveniences. On top of that, it's an outstanding value!This coupe has 83096 kms. It's red in colour. It has a manual transmission and is powered by a 304HP 3.6L V6 Cylinder Engine. Buy this vehicle now for the lowest bi-weekly payment of $203.77 with $0 down for 36 months @ 6.99% APR O.A.C. ( Plus applicable taxes - ). See dealer for details.